ARCTIC MOUNTAIN FRONT SUSPENSION WITH FOX FLOAT 3 EVOL SHOCKS: The Arctic Mountain front suspension packs the essentials. The ProClimb-7 mountain ski is 7 in. at the tip, tapering to 6.5 in. at the center to enhance your carving. Single-post, angled-out spindles help you shed some sled weight while maximizing quality and strength. The premium FOX FLOAT® 3 EVOL shocks offer lightweight design, simplified adjustment and premium bump control features of the FLOAT 3, but with improved resistance to bottoming and reduced cornering “roll” thanks to the added EVOL air chamber. 1.125 IN. DROPPED DRIVESHAFT: The King Cat’s increased track-to-tunnel clearance of 3" allows us to use 8-tooth drive sprockets on this model, giving you a flatter approach angle with more floatability and maneuverability. 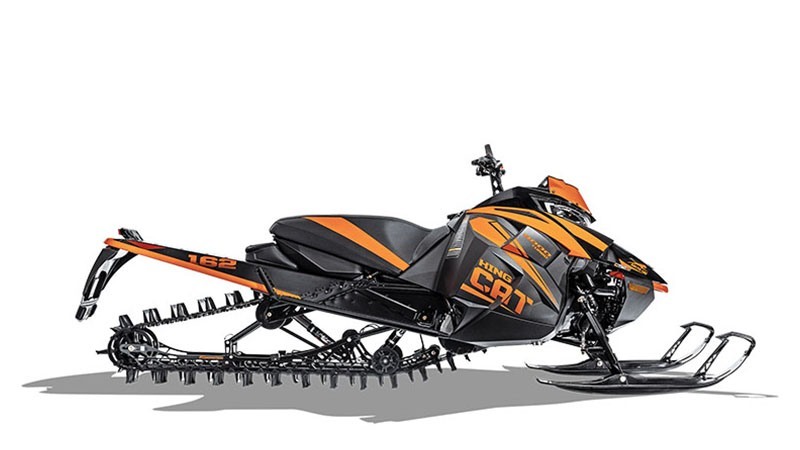 In addition, you’ll also notice a mountain of difference in your sled handling. This update in the King Cat delivers a more efficient power transfer to the snow, letting you enjoy more horsepower when climbing, carving, sidehilling and boondocking. The mountains are tough. Now you’re equipped to get tough right back. 162 IN. POWER CLAW TRACK WITH 3 IN. LUGS: This lightweight, ultra-long 162 in. single-ply track with a 3 in. pitch sets the standard for deep snow performance. Stagger-set, curved-forward paddle towers won’t fold over. The new industry-leading 3 in. lug grips the powder like none other. PROCLIMB - 7 SKIS: The new ProClimb-7 mountain ski is 7 in. at the tip, tapering to 6.5 in. at the center. The wider skis enhance your carving abilities and prevent unintended downhill braking. A wider ski damper featuring a longer axle and bolt increases lateral adjustability. LOW-HEIGHT WINDSHIELD: To be the king, you have to look the part. The new low-height windshield is bringing style to the top of the mountain.